We have constructed a language detector consisting of about 374 languages. It can detect both living and extinct languages (e.g. English and Tupi), identify ancient and constructed (e.g. Latin and Klingon) and even different dialects. Each language class has been named with its English name followed by an underscore and the corresponding ISO 639-3 three letter code. E.g. You can try it here, it needs a few words to make accurate detections. Some of the rare languages (about 30) may have insufficient training data. The idea is to improve the classifier as more documents are gathered. 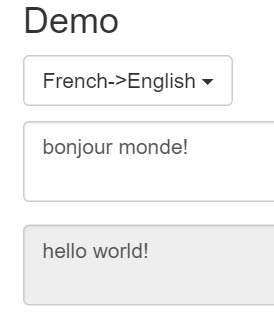 Also we may add more languages in the future, so make sure your code can handle that. Did you know there’s a way to classify texts without having to leave Excel? 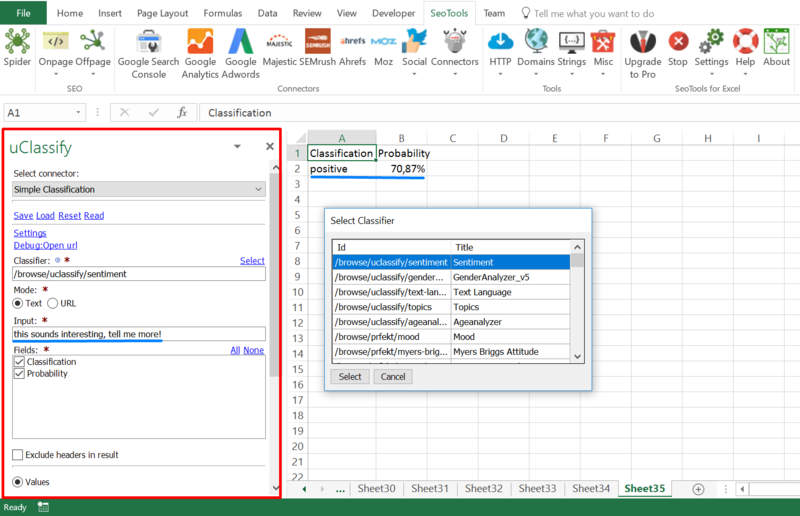 We have paired up with SeoTools for Excel, a Swiss army knife Excel-plugin, which offers a tailored “Connector” for all uClassify users. 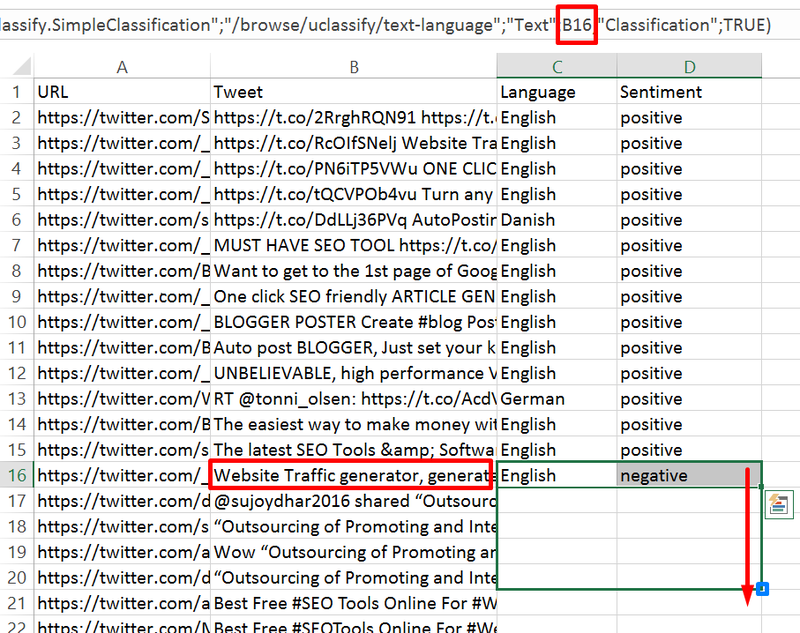 In this blog post, we will show how SeoTools allows you to classify lists of texts or URLs with the classifiers of your choice, and having the results ready for analysis in a matter of seconds. Don’t be worried if your Excel spreadsheet doesn’t look as the example above. 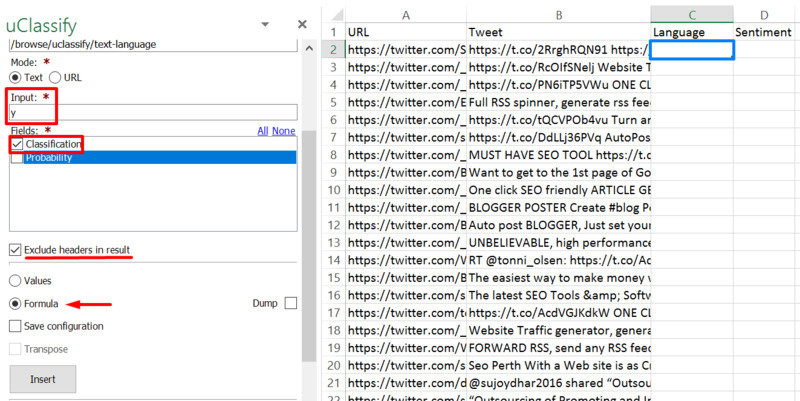 The extra ribbon tab “SeoTools” is added when SeoTools for Excel is installed. At the end of this post you find all the links necessary to setup your uClassify account. The uClassify Connector is, as the name suggests, connected to uClassify library. 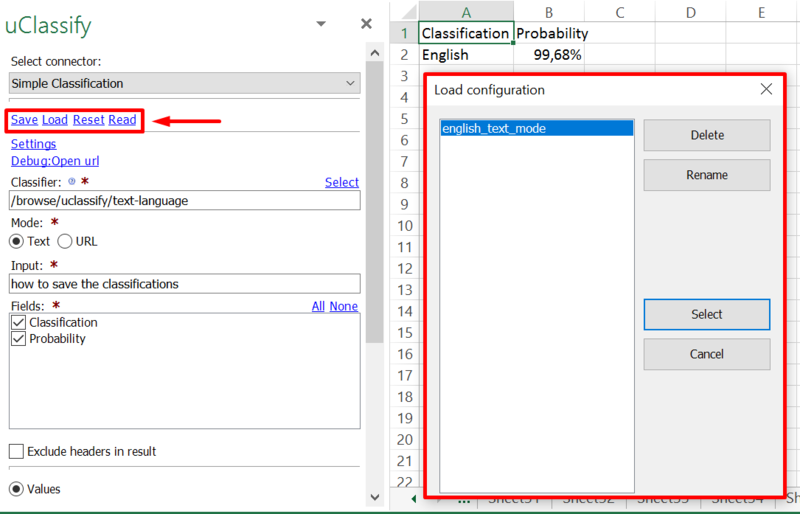 Clicking on “Select” opens a window of all available classifiers. It is also possible to choose input type (Text or URL) and if the results include classification and probability. 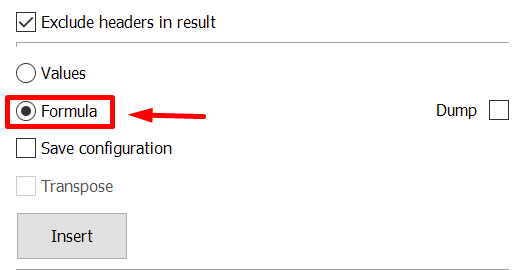 When you are satisfied with your settings, click “Insert”, and SeoTools will generate the data in columns A and onwards. Next time, just load a previous configuration and you will get classifications based on the same settings as last time. Next, you can change the formula to reference a cell and the uClassify Connector will generate results based on the value or text in that cell. In the following example, company A has been mentioned 100 times on Twitter in the last week and we want to determine the text Language and Sentiment for these tweets. First, select the Text Language Classifier and enter a random character in the Input field (we will change this in the formula to reference the tweets). 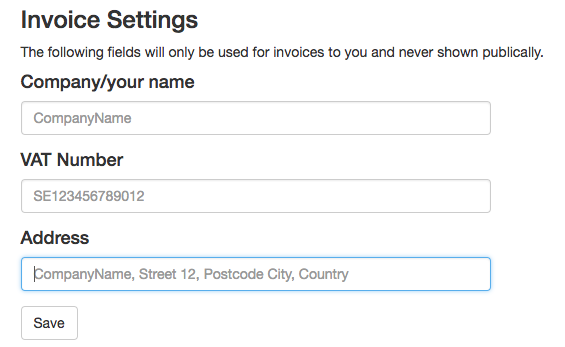 Also, don’t forget select “Exclude headers in result” since we only want the values for each row. Do you want to try it with your uClassify account? ⦁ Sign up for a 14-Day Trial and follow the instructions to download and install the latest version of SeoTools. The complete documentation of the uClassify Connector features can be found here. If you have any questions, feedback, or suggestions about ways to improve the Connector, please contact victor@seotoolsforexcel.com. We get a lot of requests for classifiers in different languages and as a next step we are building a translation API. The idea is to have an affordable in-house machine translation service that can quickly translate requests to the classifier language, classify the request and send back the response. Since the majority of classifiers are in English, the primary focus will be to target English. Initially we support French, Spanish and Swedish to English translations. The API is accessible with your ordinary API read key and a GET/POST REST protocol. You can test and read all about the translation API here. Please don’t hesitate to report any weirdness to me! 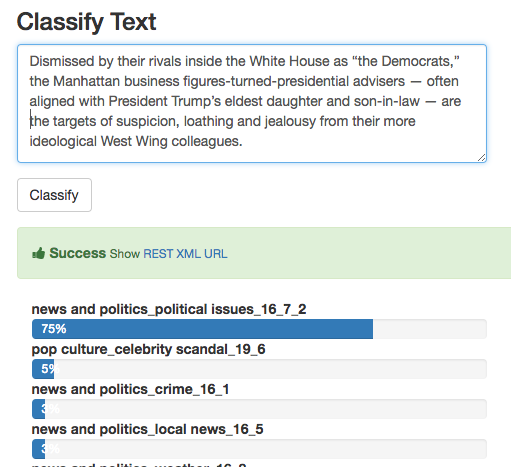 Upon popular request I’ve built a new topics classifier based on the IAB taxonomy. EDIT: We also support the IAB Taxonomy V2 now. 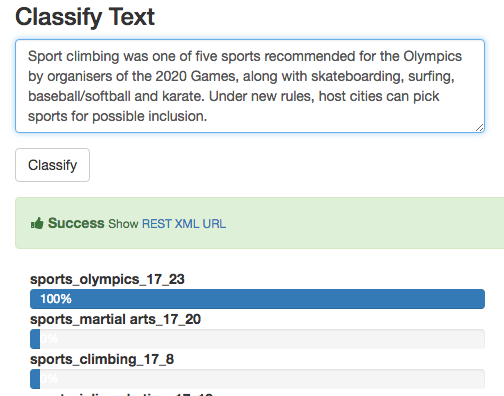 The classifier has two levels of depth, a main category (sports, science…) and a sub category (soccer, physics…). In total there are about 360 different classes following the IAB Quality Assurance Guidelines (QAG) Taxonomy specification. You can try the online demo here. The last two ids are the IAB ids, this will make it easier for users tho map and integrate the result. With a free uClassify account you can make 1000 free calls per day, if you need more there are affordable options from 9€ per month. You can sign up here. IAB12 News and IAB24 Uncategorized is not supported. * IAB12 News and IAB24 Uncategorized is not supported. The new URL REST API is our simplest to use API. You can copy paste the API url in the browser and get the result. The read api key and text are passed as parameters in the url. The only thing you need to do is to sign up for a free account (allows you 1000 calls per day) and replace ‘YOUR_READ_API_KEY_HERE’ with your read api key (found after you log in). Here is the documentation for the api. The API is a simplified subset of our standard JSON REST API, you can read more the uClassify API differences here. I am very happy to announce this performance update that means that classification will have better accuracy than before. When I was building a new topic classifier based on the IAB taxonomy I did notice some weird behaviour for classes with much less training data than the others. As I started to investigate this I was able to understand how the overall classification could be improved, not only those with low training data. After weeks of testing different implementations I found a few improvements that significantly gave better results on the test datasets. In short classifiers are much more robust and less sensitive to imbalanced data. This update doesn’t affect any api endpoints it will only give you better probabilities. I might write a short post on the technicalities of this update.